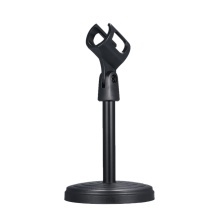 This compact microphone stand designed for heavy duty carrying. 360-degree adjustable, can be set to suitable angles as you need. Suitable for holding the microphone on the desk for meetings, lectures, speaking, podcasts, screencasts or video chats, etc. Made of eco-friendly material, high strength, sturdy to use. Round base can keep be placed on desk or table firmly. 360-degree adjustable, can be set to suitable angles as you need. Dismountable design, portable to carry, convenient to use. Suitable for discussion, conference, report, live interviews.